Outer Space Action - Cowboys, Aliens, Magic and Mystery! 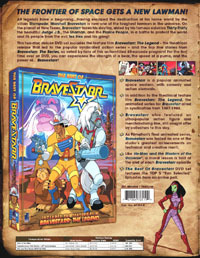 THE BEST OF BRAVESTARR includes special features produced by Andy Mangels including interview featurettes, plus commentary track, art galleries. and much more! 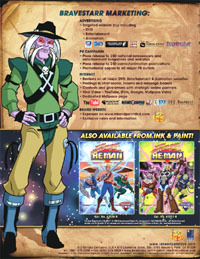 Los Angeles, CA BCI, a Navarre Corporation Company, and leading UK media company and underlying rights owner, Entertainment Rights Plc (ER) will release Bravestarr, the popular animated space western that brought the old west and the future together in an exciting and groundbreaking adventure series. 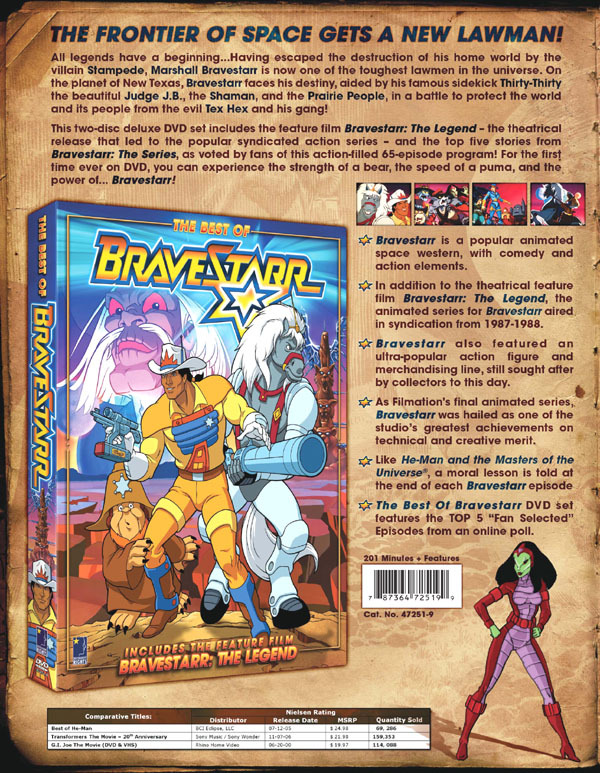 The two DVD set, which will be released under BCIs Ink & Paint brand, includes the top five fan selected episodes and the theatrical feature film Bravestarr: The Legend. The set will be available July 3rd at a suggested retail price of $24.98. Marshall Bravestarr, a hero of Native American descent, has escaped the destruction of his home world by the villainous Stampede. 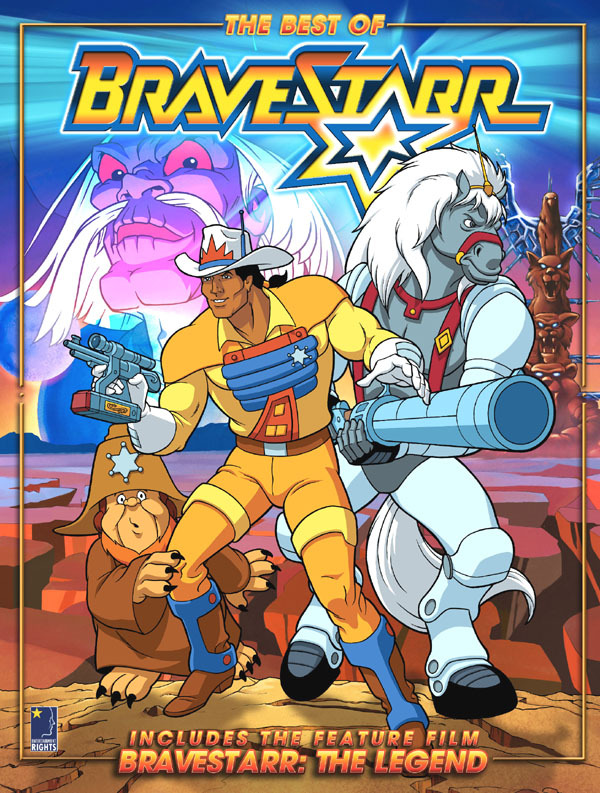 Now one of the toughest lawmen in the universe, Bravestarr comes to the planet of New Texas to face the good, the bad, and the weird. Aiding him in keeping the peace are his trusty sidekick Thirty-Thirty (a sentient transforming horse), the beauteous Judge Bean, and the diminutive Prairie People. 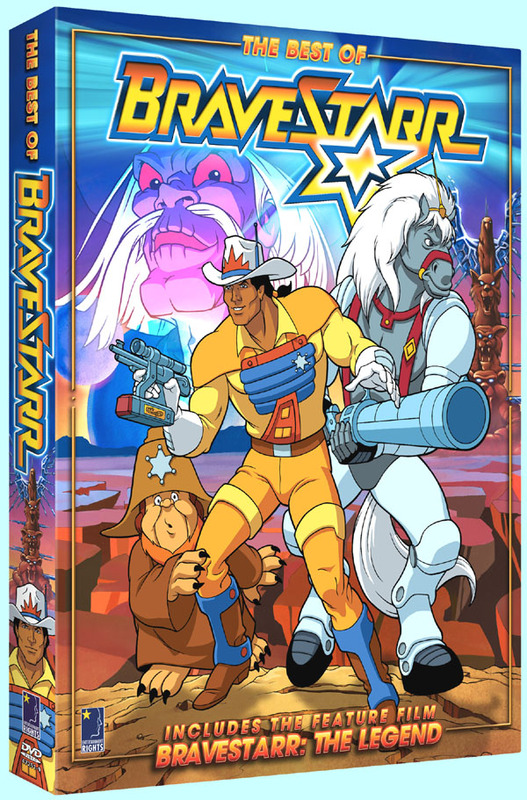 The world of Bravestarr is an action-filled fantasyland loaded with danger, excitement, and a winning mix of great space adventures and classic westerns. This DVD set includes the feature film Bravestarr: The Legend  the theatrical release that led to the popular syndicated action series  and the top five stories from Bravestarr The Series, as voted by fans of this action-filled 65-episode program! 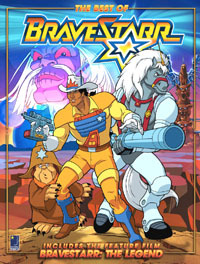 Episodes included are Eye of the Beholder, To Walk a Mile, Fallen Idol, Texs Terrible Night and The Price. The Best of Bravestarr is not just a retro cool collection made for the devoted, but a rediscovery of an animated series thats sure to gain new fans in the new millennium and beyond! * "Saddling Up With Bravestarr: The Legend Documentary - A look at the origin of television's most popular animated science fiction western, including interviews with producers, writers, animators, and other Filmation personnel. * Feature-Length Audio Commentary Track for "Bravestarr: The Legend" with Producer Lou Scheimer, Director Tom Sito, Voice Actor Pat Fraley, Animator Tom Sito, and Voice Director Erika Scheimer. Hosted by Andy Mangels. * Rare Footage: Promotional presentation of Selected Scene from Bravestarr: The Legend and live-action footage for rotoscoping. 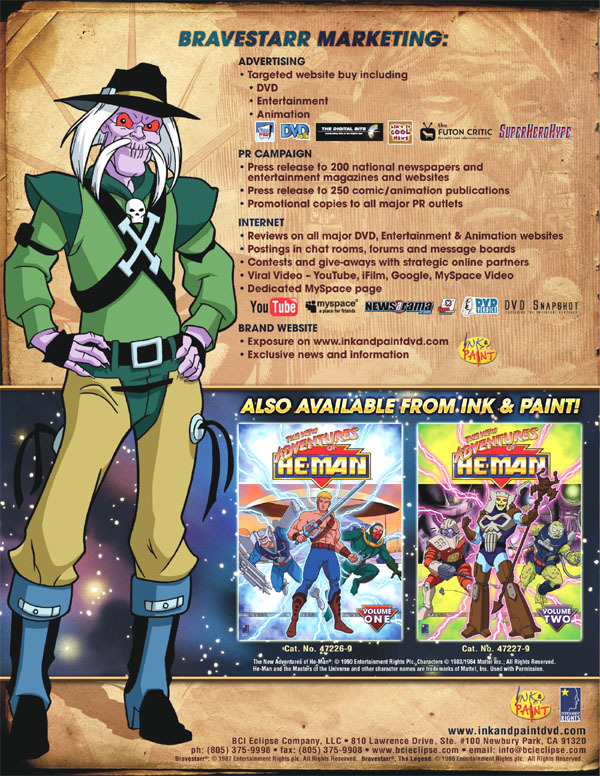 * Image Gallery of Bravestarr: The Legend promotional art and advertising. 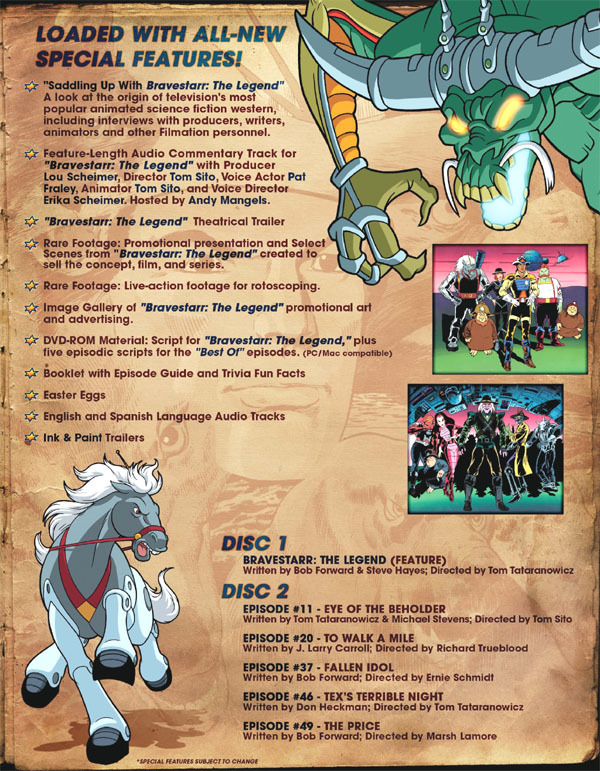 * DVD-ROM Material: Script for Bravestarr: The Legend, plus five episodic scripts. 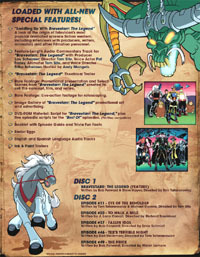 * Booklet with episode guide and trivia fun facts. Producing the special features, documentary and most of the extra content is entertainment writer Andy Mangels, a best-selling novelist, and author of Animation on DVD  The Ultimate Guide. This release will be supported with a print campaign and internet exposure including viral video and targeted advertising, including special distribution at Comic-Con 2007. Click Here to Go to the MAIN BCI DVD Page! And scroll down this page for more fun! All featuring excellent Special Features produced by Andy Mangels, including documentaries, commentary tracks, and much more! THE BEST OF SHE-RA: PRINCESS OF POWER: & "SECRET OF THE SWORD"